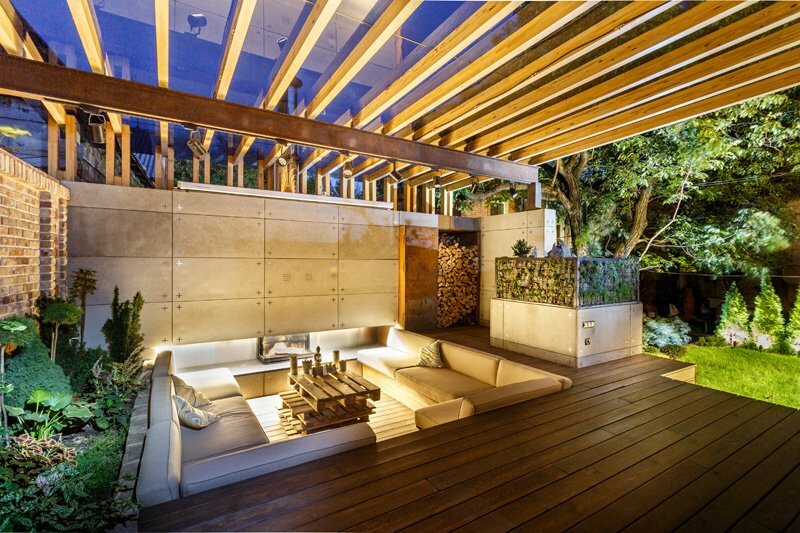 A wonder of landscaping featuring a contemporary multi-function outdoor lounge. 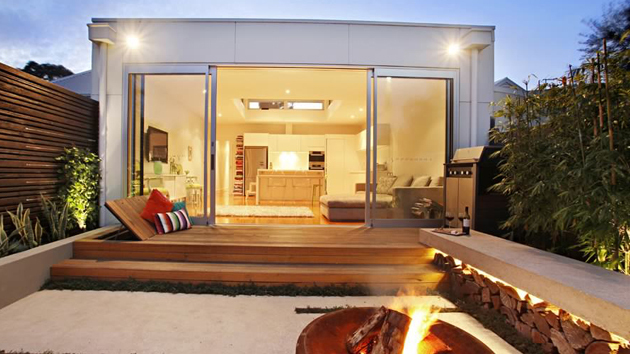 Aside from the home itself, we would always want to add some interesting appeal to our outdoor area. Of course, this includes the garden, landscaping, and even the pool area too. But what if your home is in the city and you do not have enough space for a vast garden or for lush greens? Well, you can still add a beautiful outdoor space on the roof top or even just a small space in the front yard. Nothing beats having a relaxing outdoor area. Hence, you have to look for a way to have one. And I know, after seeing this beautiful outdoor space we have today, you will surely be inspired to have one. A multi-function lounge area located in Dnepropetrovsk, Ukraine impresses everyone who sees it with its sunken seating. Aside from that, it has a drop-down projection screen for watching movies while outdoors. 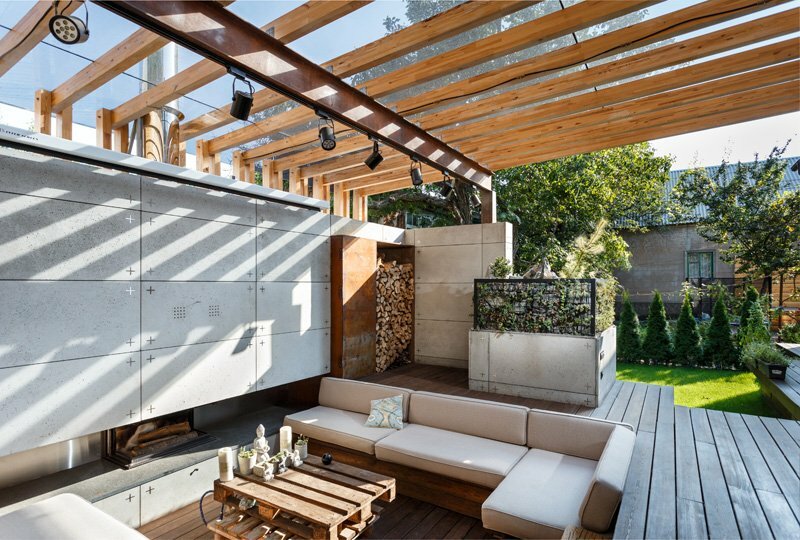 The compact patio was transformed into a multi-functional lounge area, where the owners and their guests can spend time while comfortably admiring the beauty of nature. It is considered as a small oasis of the noisy city. The atmosphere becomes very dramatic as the laser light projector creates a play of light and color on the textured surfaces of the area. At the entrance, there is a small lawn, which is isolated from the neighbors with hedges. It also complements with the space and also serves as a play area for the children. 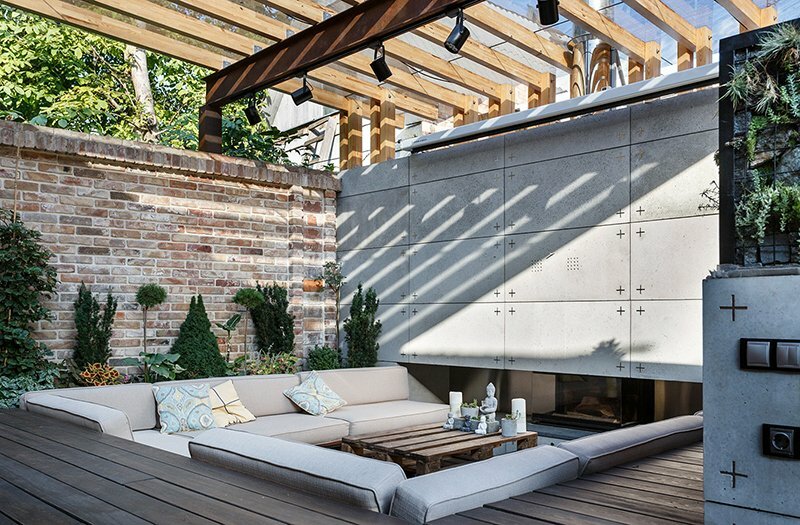 The lounge makes use of natural materials that includes wood, metal, Ekaterynoslavsky brick, and stone gabions. It is also combined with an abundance of greenery that is used in the finishing. 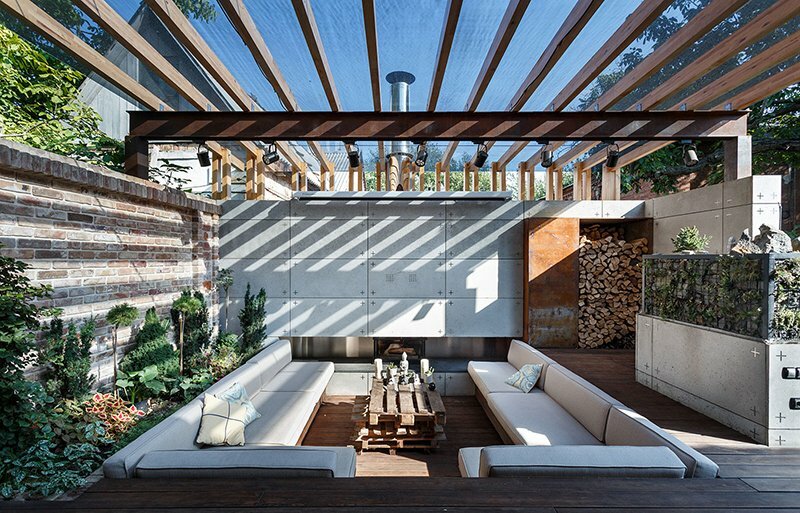 Let us take a look at this gorgeous outdoor space through the images below. 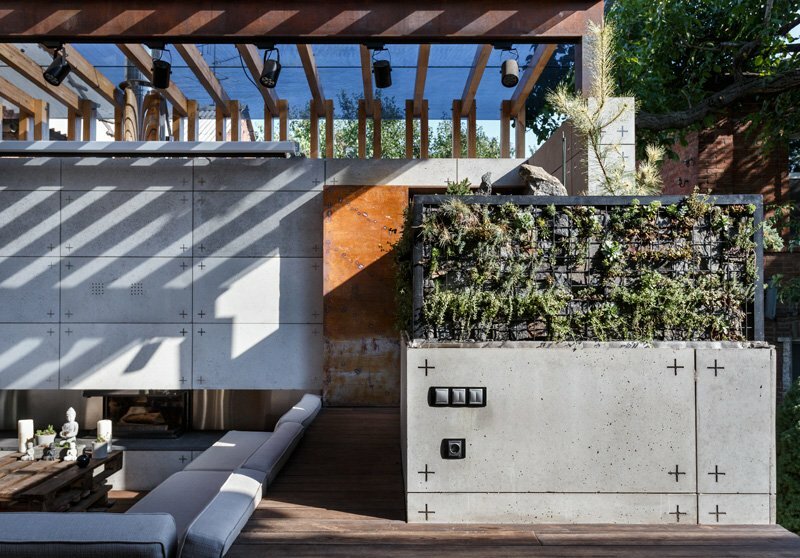 Unique feature: A patio was converted into a contemporary outdoor lounge that used natural materials and features a drop-down screen for watching and entertainment. You can see that the space used for the seating isn’t really huge but it does look really lovely because of how the layout is done. You can see that the living area here is sunken into the wooden flooring. It would really be interesting to go down the outdoor living area and take a seat. It used comfy furniture for seating which will make you feel very cozy and relaxed. In the center is a table that is made from pallets. Around the area are wooden planks used for the flooring. But you can also see other types of materials like the concrete panels on the walls as well that corten steel near the storage of the fire wood. During the night, the area looks very stunning because of the play of lights. You can see where the light came from which brings a lot of drama to the area. Even the plants were lighted, making it appear even more beautiful. Notice how light touches the various texture used here. I like the combination of the brick walls, wooden flooring and the concrete. It creates contrasting textures which are all softened by the plants of various types added in here. It looks like a small whimsical garden for me! 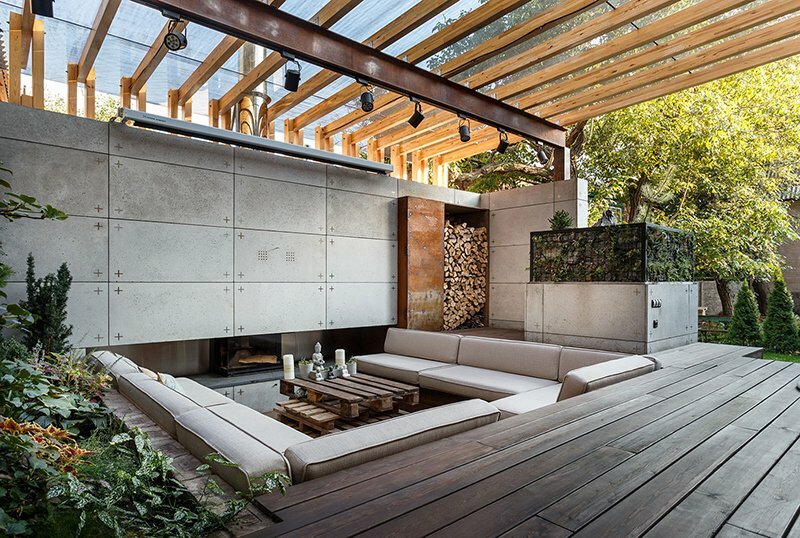 The outdoor lounge has a roof that is made from a combination of steel and wood. There are also lights with industrial design attached on it to illuminate the area. You can also see here a fireplace that is enclosed in glass just under the concrete panels. 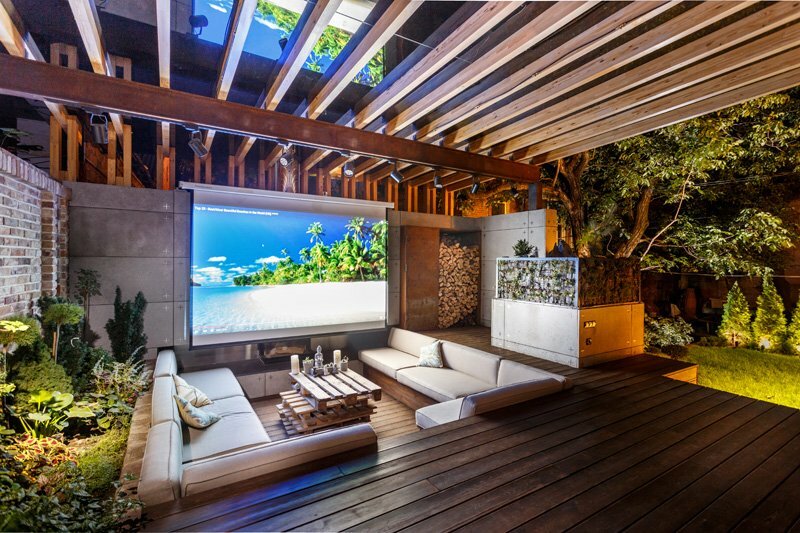 The outdoor lounge has a drop-down screen for watching movies. Isn’t this nice? You can enjoy a movie marathon with family and friends while bonding with nature since this is surrounded by a garden. 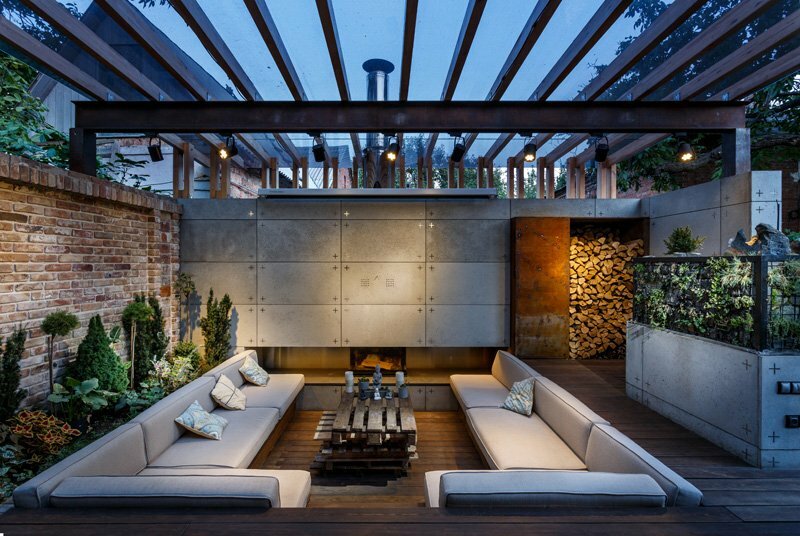 Anyone would love to get an outdoor lounge like this especially with all this beautiful contemporary features it has. Even the way the firewood is stored is very impressive and artistic as well. And there are hedges all around too to protect it from noise. Notice that cage-like item here where stones and plants are added. Isn’t it beautiful? It compliments with the concrete panels used in for the walls. Isn’t this very beautiful? It sure is nice indeed. It looks very inviting and relaxing. It also used natural facture and texture which are combined in harmonious way. SVOYA Studio used concrete panels that they created which gave solidity to the space. The material adds a rich but not over-saturated detailing to the sunken seating area. Its roof use tinted glass and fogging system creating a comfortable environment in the open air no matter what time of the day it is. Yes, you can stay in this outdoor lounge even in the hot afternoon because of the roof it used. And it looks really relaxing whatever is the weather! Do you agree with me? I am sure you are also dreaming to have a space like this one. 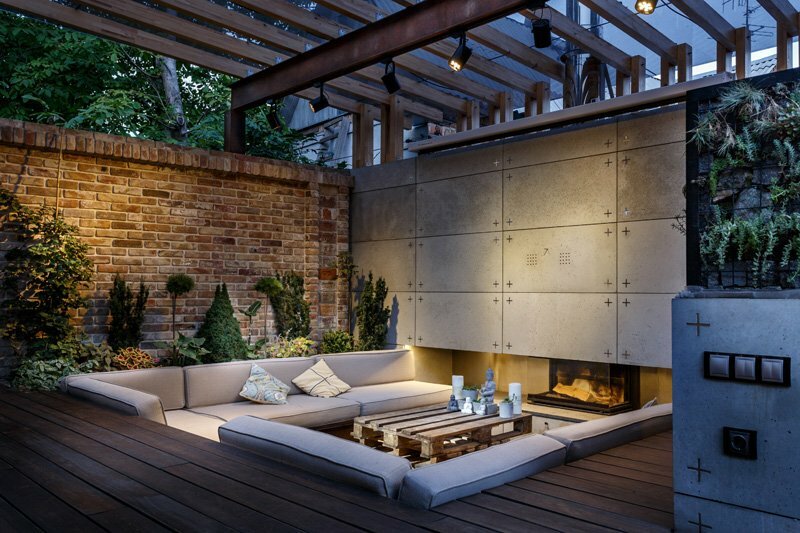 Are you planning to have an outdoor lounge in your home too?